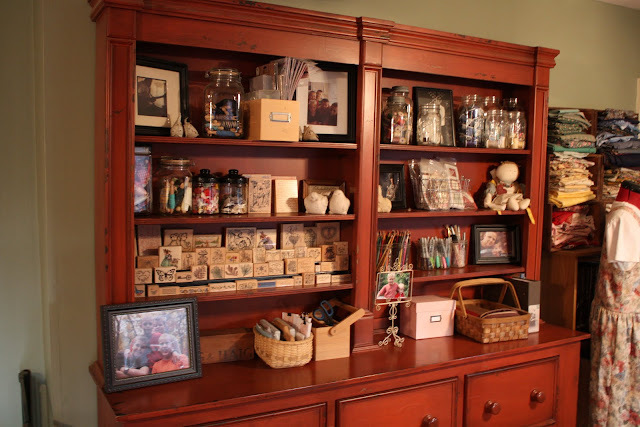 fter many requests.... (you know who you are!~ wink) I am going to give a little tour of my sewing/craft/homeschooling-in-the-winter room. Whew! My situation is a little unique in that my "command central" is in the front room in our house. I really like being out in the midst of everything that is going on, but I try to be careful not to leave "works in progress" strewn about the room for too long. Actually, come to think of it, that may be good as well! I was tempted to put off this post until I could finish several things here, but in the interest of being "real," I'm going to go ahead and post. Tom and I have always been committed to doing things when we had the cash, so this has been pieced together over the 24 years we have been married, acquiring some things here and others there. Definitely a work in progress. 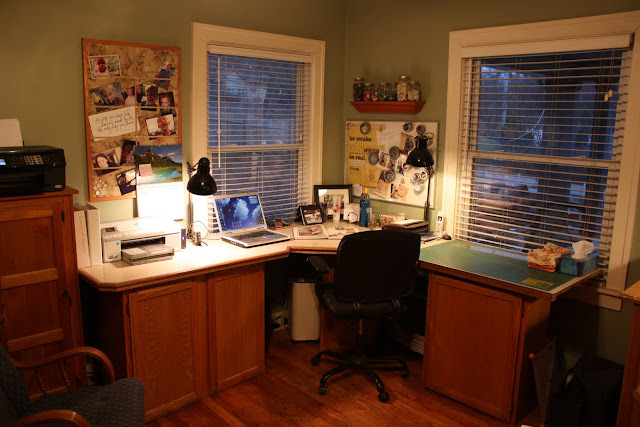 When you enter our front door, to your right, this is what greets you: my little office/studio! Welcome! I am in the midst of several sewing projects right now, so you are seeing "real life" here. I have a little closet in the hall that I store my sewing machine and serger in when I am not using them, but today they are out and humming happily away, that is, when I put my camera down. Also, I hate it when people appologize for photos, but I'm going to anyway. I can't help myself. Sorry it was so cloudy again! Not a good day for photos, but I'm doin' it anyway! So there, cloudy March day, take that! I just painted the big chalkboard area behind the counter... so fun! I used magnetic paint first (did you know you could purchase that at Home Depot? ), then coated it with chalkboard paint! The chalkboard is ready to be "seasoned" by rubbing chalk all over it, but I haven't decided how to frame it in. Am I going to paint on a frame or purchase trim boards and nail a frame up? Decisions, decisions. Anyway, I'm lovin' having favorite black and white photos up there and am envisioning some favorite Bible verses and/or quotes, and perhaps even some crafting "to do lists" there as well. As I said, "work in progress..."
On the opposite wall is one of the first pieces of furniture that Tom and I have ever purchased (just last year!). So funny, but true. We've been married almost 24 years now and finances simply wouldn't allow me the luxury of even garage sale shopping for most of our marriage. We haven't had to sit on the floor though! My parents have generously handed items along to us as they have replaced them, as have other friends, etc. I'm totally fine with waiting on the Lord and enjoying His provision in His time. This red hutch we did purchase though, at an amazing price from the same company that made our kitchen cabinets. I love this piece of furniture! The red color, the distressing, the shelf space, all of it! I should have stepped back further when I took the photo, but there is a nice space under it which you can't really see, that I would love to fill with big baskets at some point. Big balls of yarn in one, etc.... I'm sure I will find just the right thing to go there when it is time. 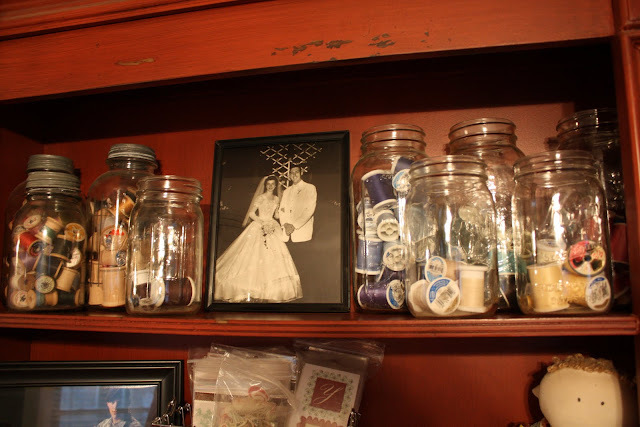 On the other side, my parents wedding photo, my thread, again organized by color, markers, colored pencils and a basket that I keep my Bible and pens so I can easily grab it and go any time. To the right of my red hutch, I have my dressform which I purchased at a black friday sale a few years ago (it was the only thing that could tempt me to brave a "black friday" sale... but that is another post entirely!) and my calico fabrics organized in cast off drawers turned on their side, again, by color. Under the fabric are photo albums and sewing/crafting books. Then there is this corner of my room... my computer is here, plus the printer/copier that I use for school and a photo printer. This "L-shaped" countertop was one of my first acquisitions... we found this mis-cut piece of kitchen countertop for $15... probably almost 20 years ago now. I originally had two-drawer file cabinets under each end and a sawhorse under the back corner, but gradually we were able to replace those. Still it is missing some trim and certainly isn't perfect, but I really, really like having all that space to work on! Did you see my button jars on the shelf up there? You guessed it, color coded! Love these buttons... many are from my great-grandmother, some from yard sales, and some I have added through my 25 years of sewing. And here is a view looking back toward the front door. Looks like little Tim is ready for bed! He's playing a song for you on the harmonica! Did you see the three drawer plastic cart? 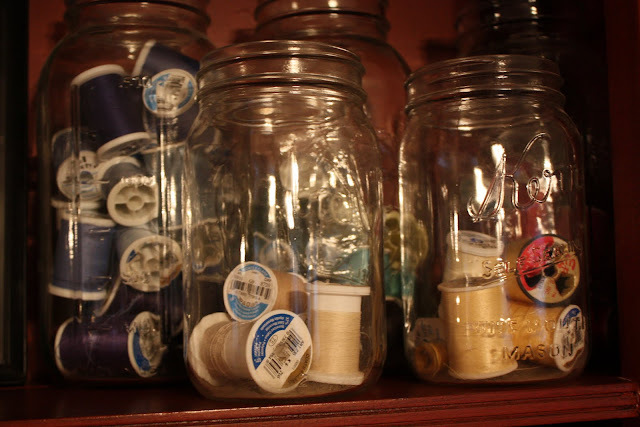 I don't leave it out, but it is nice to store the sewing projects that I am working on there. I roll it into a hall closet to put it away, and can easily pull it out when I am ready to work. 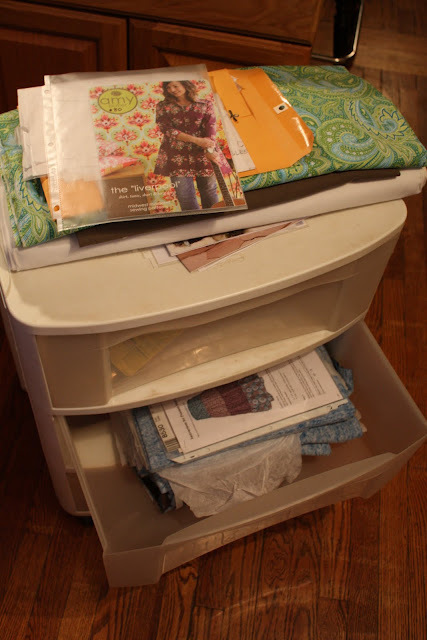 I have a great way to store sewing patterns which I'll share soon. 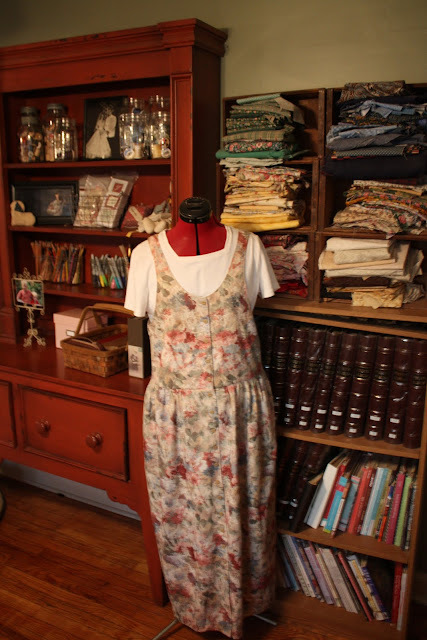 Here's that same area, when I'm not sewing there... ready for school work. 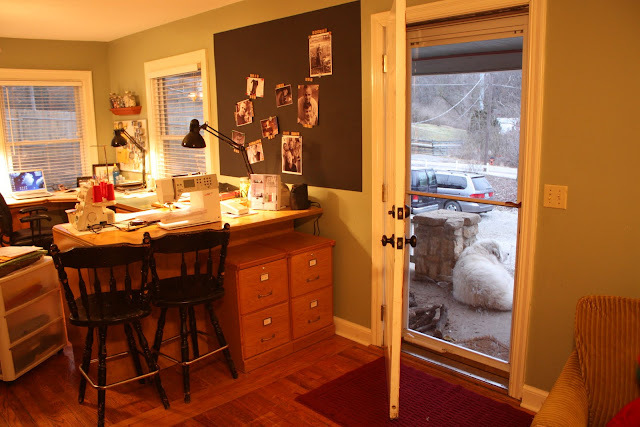 I do have an actual homeschooling room, a finished basement room. We heat with wood though and it stays, like 47 degrees F. down there most days since the wood stove is in the front room here on the main floor. I'm much happier up here by the woodburning stove, so the children who work one-on-one with me simply bring their schoolwork up to me and we work here most days. I actually like working up on the main floor because it is easier for me to pop in the kitchen and tend to some cooking, plus be sure that everyone is "profitably occupied," if you know what I mean! Remember my Scrabble magnets? The children and I had fun using them to label the black and white photos that I put on my magnetic chalkboard. There you have it... one of my favorite rooms in our house! I love all that goes on in this room... investing in my chidren through teaching them, and the creativity that happens here. What a priviledge it is to serve my family through sewing and creating a home for them with the things we have. A rich life, indeed! Thanks for stopping by~ I *love* having you visit here! Very cool. Love your spring header. Good thoughts, considering I know where you live and that snow is coming!! Lol! 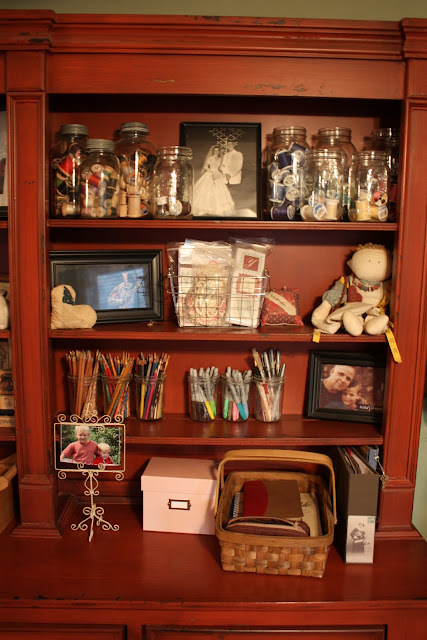 Love the button collection, quart jars of stuff, and sewing area. Love it! Loved your pictures, thanks for sharing, it really inspires, like looking at a magazine. Some of the ideas I have been waiting to do when the Lord frees up or changes the space we have ;-) They are filed away in my heart. Love it! So organized. Just makes you want to create! Oh I love your work area!!!! 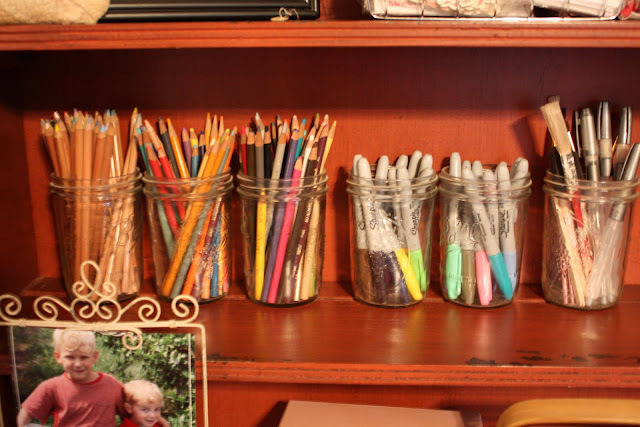 I also put things in canning jars - so pretty!!! 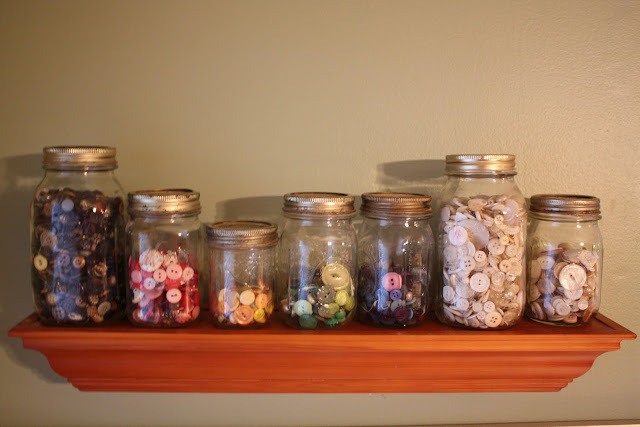 Love your button collection!!! 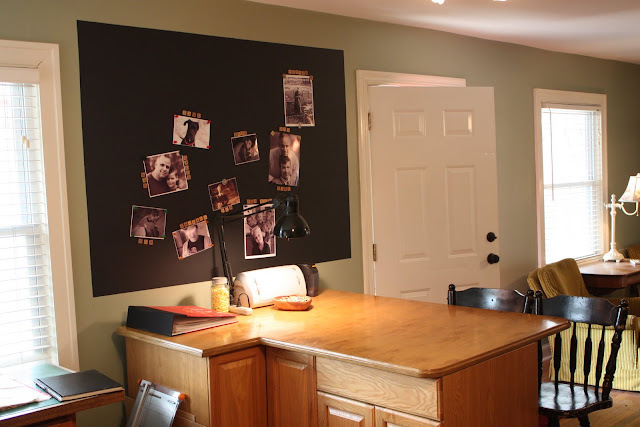 I recently painted a big chalk board area on a wall in my house and learned a few things along the way - we couldn't afford the magnetic paint so ours is just chalk board. I used molding to frame ours in and I am so very glad I did!!! The little lip from the frame makes the perfect chalk dust catcher!! Without it we would have chalk dust sprinked everywhere. When I made the chalkboard I had intended to use chalk markers but they are very difficult to clean off the wall for some reason and they are just too expensive for everyday use so it's regular school chalk which leaves lots of dust (partly because I left the slight texture on the wall - one thing I would change if we ever do it again :0)!! A fun project though and it's been a fun thing to keep the little ones entertained and great for school. Funny thing though is that any teens that come and hang out at our house always get the chalk out and draw all over the wall - they love it and really can't seem to help themselves - they just have to draw pictures on that wall!!! Thank you for sharing!!! I hope your Grandmother is doing better!! 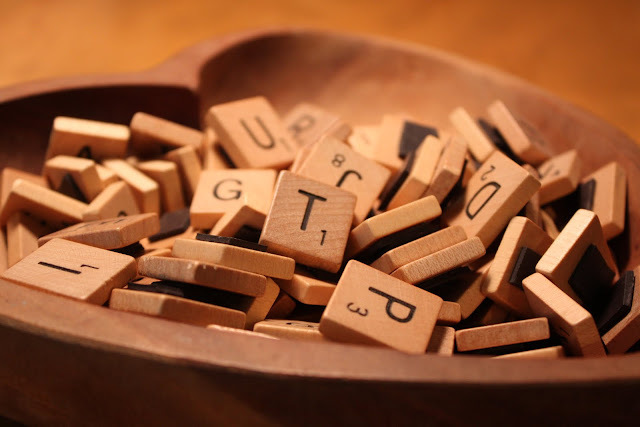 The photo of those scrabble pieces is great...love it! 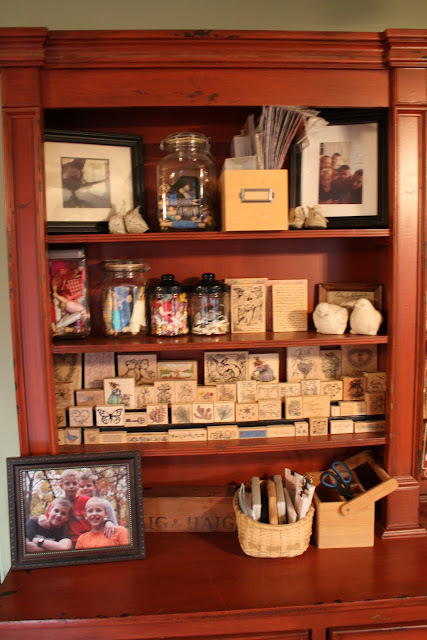 And that cabinet/hutch that you bought is gorgeous...love the way you have it all organized. Colour coding the buttons is a good idea ~ I like how you have arranged the shelves...looks so country and homey. The roll away sewing cart is another excellent idea...perfect to keep things organized and "out of sight" too. What a lovely room. Thanks for the tour. What inspiring photos you have! Thanks for sharing them with the blog world and me! I have a little corner, but it is not as nicely organized! Something to strive for. I *love* this post and so glad to have found your blog. In the coming weeks we hope to do a magnetic wall too. And I the scrabble tiles are a neat idea, we'll have to use. We too do projects as the pocket can afford it without using credit. Our last family project was our kitchen. I'll be back to look around. I love it! Thanks so much for sharing all your creativity and artistic touches. I went to a seminar once that I think you live out beautifully...it was called "creative contentment". The idea is that God can give you creative eyes to look at things around you without spending much money. Being content can make you MORE creative with what you already have. (Your drawers are a perfect example!) Let me know when you are ready to teach it and I will be there! I don't always get a chance to leave comments, but I wanted you to know I have been enjoying our tour of your home so much! Thank you for sharing with us! I also looked at the kitchen pictures and the kitchen looks so nice! love your new header! 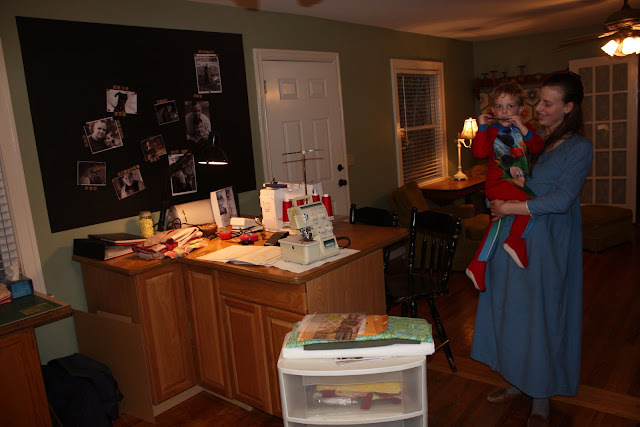 your craft/sewing/homeschool one on one room is fabulous! i appreciate you sharing your commitment to purchasing when you have the cash and that that means things are a work in progress. oh, how i know that to be true! Well...I have been trying to comment & due to some "technical issues" last eve I could barely do anything on line! :( So here we are. What a "wonderful blessing" I have been so blessed & encouraged from your beautiful tour through your sew/sch/craft/office room! I have to first thank you for making everyone feel so welcome, your photo's & the March weather are things so for real & makes us (I know me for sure) feel at home & that yes, we are all real. I am also glad to know that you & your husband are taking the "as we can afford" way to do your home. We have had a lot of "outside" pressure from others with the...why not charge & get it all done at once & pay next year...um-tried that on things once and the lesson's were strong enough that once was "enough"! Ha! So, ours is always & has been a work in process...for years! Having come over & looked at your...what our family is now calling the ::Welcome Center:: we are so encouraged to move ahead with our thought's on...hey we can lay out our rooms however best fits the needs of our "family" during this season of our life! I want you to know that so much more shows on the photos than just the "room"...we see love, contentment, and joy of family. Please know the only other request is that now we'd like you to come and help us move it all & organize! Ha! How about that coffee, tea? And we can make some cookies reg or gluten free! So come on over! My daughter Abigail is so happy to meet another Moma that color codes her "buttons" :) she always helps me do this and believe thought it was just me! This is my first visit here and WOW what a great tour of your favorite room! I think the chalkboard would look great with a painted border. Maybe with some scripture painted into it across the top? ~Pam... I'll not have the "s" word spoken here... at least not this close to spring! LOL! ~Michelle and Wagner famiy... thanks! You guys are the *best*! ~Cinnamon, wouldn't it be fun if we *did* live closer and could be "partners in crime, decorating, that is"... wait, I probably wouldn't get school done... and after all, you did a fab job on *your* chalkboard! Love it! ~Camille, Leanne, Kathy G., and Laura, thanks *so* much for all the kind comments~ you guys really know how to encourage someone! ~Susan, I think you are right... contentment makes it all a fun adventure! I never thought about creativity being linked to contentment... that's intriguing. ~Traci and Antfarmmom, so very nice to "meet" you here! I'm really glad that you stopped by to visit~ hope to see you again soon! ~J, thanks... yep "work in progress"... I think in America especially it can be hard to remember that. Life is so much more fun when we learn to have fun as we go, rather than "when we arrive." LOL! ~Lori! Of course I'll come over... I can be bribed with hot chocolate any day! : ) I'm sure you guys will do a fabulous job though! So wonderful to get to work together on projects like that~ character-building memory making, huh? Now you'll have to show what you end up doing, ok? I'd love to see! Georgiann, (pretty name!)... so nice to "meet" you here as well! I like your idea for a verse on the frame... I'm going to have to think about that one! Nice! Hope to see you again here soon! Thanks for sharing your work space....I love that you have it right in the middle of *living*. 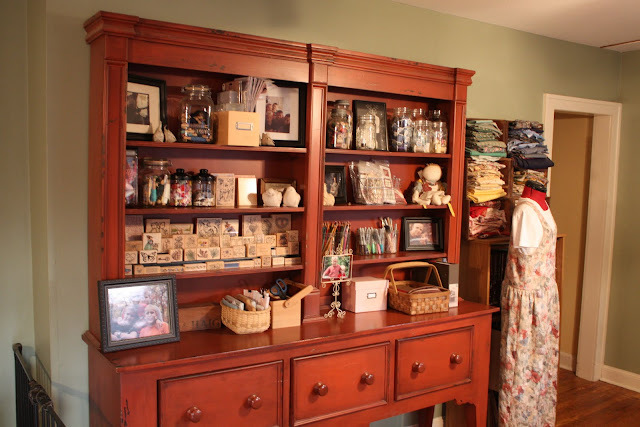 But do tell, how do you keep it (the shelves and fabric) neat and organized? I feel like we are forever in the "keeping our head above water" mode. You're doing such a beautiful job! ~Missy, I agree, the old canning jars are *great* for storing things in. You will be so glad you saved those! Also, I too have spent (and will spend) time in the "just keeping our heads above water" mode.... although now that Timmy is 3 1/2 it doesn't happen quite as often.